Are easy to digest, even on an empty stomach–they're cultured whole food! Deliver essential nutrients in their safest and most active form within the infinite complexity of whole food. Provide an energizing and protective array of phytonutrients and ferment metabolites, including cultured soy isoflavones, beta glucans, bacteriocins, glutathione, lipoic acid, and enzymes. 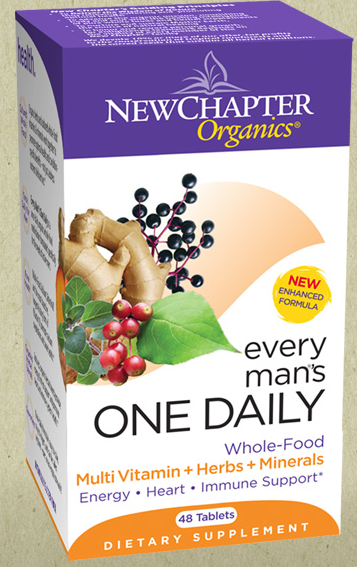 Every Man®’s One Daily delivers in one tablet 22 different probiotic nutritive and energizing vitamins and minerals as well as Cordyceps and Reishi that have been revered for supporting a man’s vitality. The addition of supercritical ginger and turmeric extracts maximizes bioavailability and efficacy. Other ingredients: Organic gum acacia, silica, organic pre-gelatinized maize starch, lac resin, and carnauba wax.